The development of the demographic science and practice does not stop on the level of demographic analysis, it relates to social problems which in any case comprise the demographic process, the important decisions determining the road of life of each person, form the so called demographic behaviour. [9;11] On the basis of demographic data and computations conclusions about important tendencies in the social development can be drawn, certain socially significant processes can be foreseen and emerging or forthcoming tensions and conflicts can be overcome. The studies in the social sphere, the development of economic projects and larger-scaled undertakings usually start with clarification of the demographic situation. Objective of the present article is the study of some demographic indices of the population in Plovdiv district. Plovdiv district is located in the central part of Southern Bulgaria, occupying an area of 5972.9 sq.m., equal to 5.4% of the territory of the Republic of Bulgaria. It is one of the regions most favoured by nature. The district has a convenient transport geographic location, has a high natural, economic and human potential, favourable bioclimatic resource, high-productive cultivated lands, thermal mineral water, very rich cultural heritage. The favourable geographic location of the district is supplemented by the availability of an established infrastructure for transport access. The territory of the district comprises the southern slopes of the Balkans, the Pazardzhik-Plovdiv field, the forest massive of Sredna Gora and the Northern Rhodopes, mountain river valleys and rivers. In a climatic aspect the region is not homogeneous – in the flat areas it is transitional continental and in the high areas – mountainous. The population of Plovdiv district as of 31 December 2015 amounts to 673283 people and constitutes 9.41% of the population of the country. As of 31 December 2015, the population of Bulgaria was 7 153 784 people. There is a decrease in the population in the district – from 696300 in 2010 to 673283 in 2015 (Chart 1). The long-lasting tendency of prevailing of the relative share of women (52%) over men (48%) is still preserved. Children and juveniles have a relatively permanent number in the observed period of time. 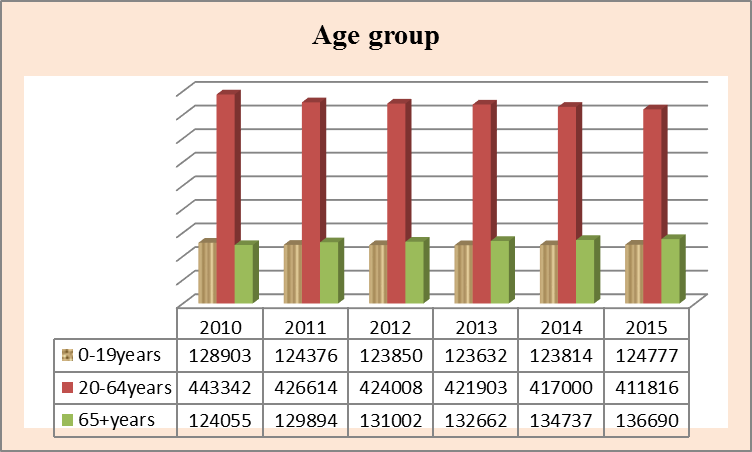 The number of people within the age range 20-64 reduces: from 443342 in 2010 to 411816 in 2015 – 31 526 people less. (4.67% of the total number of the population). The relative share of elderly people aged 65 and more increases from 124 055 in 2010 to 136690 in 2015 – 12635 people more (1.87% of the total number of people). The people living in the cities within the district constitute 74.9% while those in the villages – 21.5%. 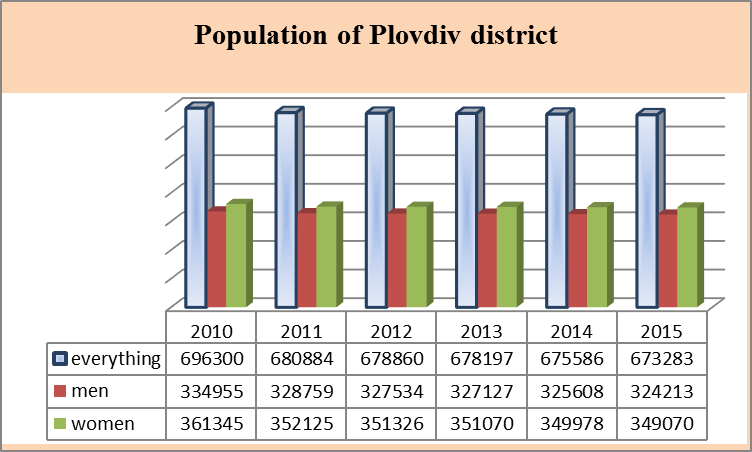 The tendency of birth rate in the district of Plovdiv marks a downward trend: from 10.3%о in 2010 to 9.9 %о in 2015. The birth rate is significantly influenced by the share of women at childbearing age, which decreases. The unfavourable dynamics of births and deaths leads to decrease in the natural growth of the population which has a permanently negative value in the analyzed time period (2010-2015 inclusive). Last year the natural growth rate in the district was (-4.8) (Table 1). The total mortality rate in the district has an upward tendency from 13.9%о in 2010 to 14.7%о in 2015. The male mortality rate is 15,9%о and as a permanent tendency it is higher than the female mortality rate – 13,7%о. The main reason for the deaths during the analyzed period of time (2010-2015) in the district of Plovdiv remains the diseases of the blood circulation organs, with intensity of 935.7 per one hundred thousand people of the population in 2015, marking an upward trend during the observed time span (Table 2). The deaths due to new formations with intensity of 270.6 per one hundred thousand people in 2015 occupy the second place. The list of causes of death is supplemented by: diseases of the digestive system, diseases of the respiratory system, external causes of morbidity and mortality, signs and deviations of the standard, found during clinical tests, not classified anywhere else. The diseases registered in the district of Plovdiv in 2014 there are 1 872.5 cases per 1000 people, compared with 1 828.8 in 2010. The same index for the children is 2 027.0 per 1000 people until 2017 and in the adults – 1 842.1 ‰ over the age of 18. Leading in the nosological structure of morbidity are the diseases of the respiratory system, which constitute 451.0 cases per 1000 people (24.1%), followed by the diseases of the circulatory system – 417.7 cases per 1000 people (22.3%). The rate of malignant neoplasms outlines a clear upward trend. The sick rate in 2014 was 4825.9, compared with 4761.3 per 100 000 people in 2013. In 2014 the rate of mental diseases in the district of Plovdiv increased and amounts to 2 803.2 cases per 100 000 people, compared with 2490.2 in 2010. The registered cases of active tuberculosis in the district have decreased in the last five-year period. The newly discovered cases are 20.3 per 100 000 people for 2014 and are below the average for the country – 23.2. In the structure of hospitalized morbidity the diseases of the circulatory system rank first with a relative share of 12.2% and intensity of 6 620.1 per 100 000 people, followed by the diseases of the digestive system – 9.5% (5 184.4 per 100 000 people), the diseases of the bone and muscular system and the connective tissues – 8.0% (4 364.2 per 100 000 people), etc. As of 31 December 2015 in the district of Plovdiv there are 34 hospitals (compared to 29 in 2010), 200 outpatient»s medical institutions, a complex oncological centre, a mental health centre, a skin and venereal centre, emergency centre, a transfusion hematology centre, a dialisys centre, a medical and social care home for children and three hospices. The beds in the inpatients medical institutions are 6 590, compared to 4843 in 2010. The procurement of beds for medical treatment is 106.9 per 10 000 people. As of 31 December 2015 there are 3239 physicians working in the medical institutions (2 931 for 2010) and 1117 dental physicians (915 for 2010). At the end of 2015 the population of the district of Plovdiv was served by 425 general practitioners. One GP serves 1584 people. The process of demographic aging continues. The relative share of the population at an active age in the district of Plovdiv is decreasing. The birth rate in the district marks a downward trend. District of Plovdiv is in a state of depopulation. Children’s mortality rate in the district of Plovdiv is still higher when compared with the data for the country. The main causes of death in the district of Plovdiv are the diseases of the circulatory system and the neoplasms. Plovdiv district occupies the second place by morbidity rate and the fourth place by morbidity rate of malignant neoplasms. Plovdiv district ranks first by the number of hospital beds per capita. The procurement of the district of Plovdiv with medical specialists is above the average for the country. The geo-demographic situation on the territory of the district of Plovdiv experiences the influence of multiple factors. Among them are, on the one part, the historical and cultural, socio-economical and demographic development of the country, and the specific influence of the marriage, divorce, birth and death rates, migration, gender and age, ethnic, religious and educational structures of the population, specific to this territory. The present article analyzes the health and democratic indices of the population in the district of Plovdiv over a 6-year period from 2010 to 2015 inclusive. The following facts have been established:  The process of demographic aging continues.  Plovdiv district is in a state of depopulation.  Children’s mortality rate in the district of Plovdiv is still high, compared with the data for the country.  The main causes of death in the district of Plovdiv are diseases of the circulatory system and neoplasms.  Plovdiv district ranks second according to morbidity rate and fourth according to sick rates from malignant neoplasms.  Plovdiv district occupies the first place according to the number of hospital beds per capita.  The procurement of medical specialists in the district of Plovdiv exceeds the average for the country.